Peter Brandt, born 1959 in Stockholm. Educated at Kungliga Konsthögskolan, the Konstfack University College of Arts in Stockholm, Crafts and Design, and Kunstakademiets Arkitektskole in Cophenhagen. Peter is reminiscent of a scientist who devotes... Read more his research to the mysteries of play. His desk drawer is full of new ideas, but he is so self-effacing that he avoids any mention of them until he is 100% happy. As a designer Peter doesn’t confine himself within restricted boundaries, but regards inspiration and artistic license as an important part of his work. He believes that there are two types of creators, those who are inspired by what happens around them and who derive something from their surroundings to create new products, and others who, like himself, are driven by the desire to solve a specific problem, a mechanical function or a particular requirement. It is important to Peter that the equation adds up. He wants to create things which are discreetly multifunctional. 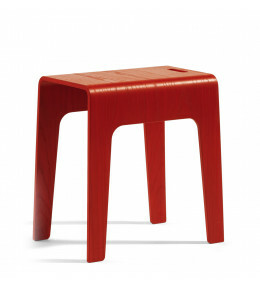 Bimbo is a stackable low stool which can be used in combination with Bimbed and Bimbord. 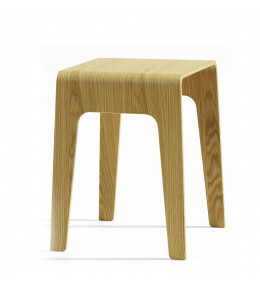 Bimbed is a stackable side table or stool which can be used in combination with Bimbo and Bimbord. Bimbord is a side table or coffee table which can be used in combination with Bimbo and Bimbed.